If you have darling Frozen fanatic in your life as well, and you're looking for the most beautiful Frozen gift you can find, look no further than this detailed work of art by Grand Jester Studios. Grand Jester Studios is acclaimed for creating Disney Busts that dynamically capture all the grandeur and power of Walt Disney's noblest heroes, loveliest heroines, and vilest villains! Most collectors are aware of their character-authentic collection of highly detailed and hand-painted polystone busts, created by award winning artists and globally recognized for their quality, originality, and sentiment. 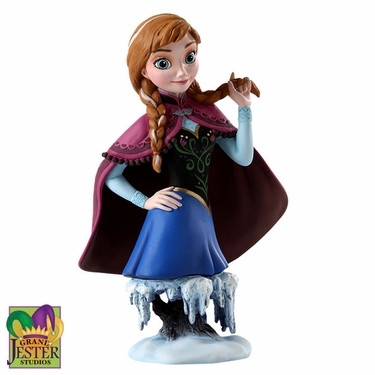 Once again, they did an amazing job with this Anna figurine - incredibly sculpted with fine detail that will blow you and any recipient away, Guaranteed! We'll let the images speak a thousand words of praise! Note: While indeed you can technically place anything you like the garden, this is a highly collectable work of art. It's not meant to be outside, and not really meant to be an action figure toy. This is a beautiful piece for a shelf, mantle, dresser, window, piano, or anywhere else you would display a fancy award or treasure! "When her big sister, Elsa, reveals her hidden power and accidentally freezes the entire kingdom, it's up to impetuous and feisty Anna to venture forth into the wintry wonderland and bring Elsa back home to undo the damage she's unwittingly wrought." Size: 7"H x 3.25"W x 4.25"L, Stone Resin. Comes in Gift Box. Felt pads on bottom to prevent surface scratching.